Last week two locals, Jessica Gibson and Leigh Northrop participated in Camp Wildwood at Kings Mountain State Park in York, South Carolina. The camp is sponsored by the Garden Club of South Carolina, the South Carolina Department of Natural Resources, the South Carolina Wildlife Federation, Harry Hampton Memorial Wildlife Fund, and the South Carolina State Parks. 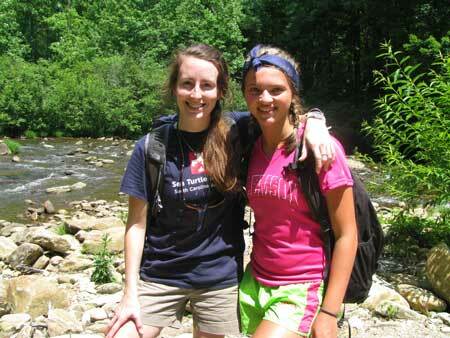 Camp Wildwood is a fun filled week during which students can experience the many aspects of their natural environment. It is a place to discover that we are part of nature and everything we do in some way affects the natural balance. At Camp Wildwood, you acquire the knowledge and appreciation needed for the protection and wise use of our natural resources. It is a place for learning self reliance, self discipline and independence in an outdoors setting. It is a place to build self confidence in relationships with adults and peers, and a place to learn how to cooperate within a group. It is also a place to learn about the diversity of our natural resources and how many career choices there are in the environmental field. Camp Wildwood is a series of three years and after completion of each, the campers are selected and asked to come back for the following year. Jessica began as a counselor last year had the opportunity to go back this year. Leigh began as a first year camper last year and was a second year camper this year in Jessica’s group. Some of the activities that they participated in include: a high ropes course and team building at Clemson University, Whitewater Rafting down the Chattooga River, and a guided hike down the Foothills Trail. For more information about Camp Wildwood visit http://www.dnr.sc.gov/campww/about.html or contact Dan DuPre at dupred@dnr.sc.gov or 803-734-4300. One Response to "Two from County Attend Camp Wildwood"
803.609.1072 is the number… 4300 is our fax number. Good article.